If you have any trouble placing your order, please contact us. 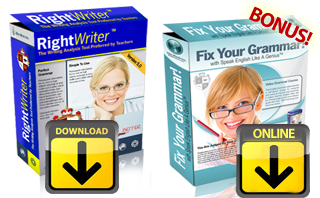 You can download RightWriter immediately AND watch the online grammar training video course. No physical disk is shipped. If you want the software on a CD-ROM disk, select the option below. You will receive an email with your username and password within seconds after purchase to access your course and download. Compatible with Windows 7, 8, 10 and later versions. Select this option to receive the Speak English Like A Genius Video Grammar Course(10 full video lessons) AND RightWriter now on one CD-ROM. You can also download RightWriter immediately after submitting your order so you can use it before the CD arrives. 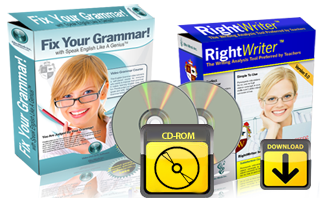 You will receive both RightWriter and the video grammar course in the mail on a CD-ROM. This is a great option if you are concerned you will have to reinstall in the future and may not have the downloaded file. Please select the download version instead.